You can find the 2013 Honda Insight at our Orange County Honda dealership. We’re proud to offer modern, efficient vehicles like the Insight, as well as Honda’s other new models. We’d be happy to help you explore if the Insight would be the right choice for you. The hybrid market is booming, creating plenty of healthy competition among manufacturers, forcing them to make better, more affordable vehicles. The Honda Insight merges efficiency with economy, making an affordable vehicle for drivers interested in a hybrid. Many actually see the Insight as a more viable option than the Toyota Prius, a hybrid class heavyweight. For drivers looking for an affordable hybrid, the Prius can’t compete with what the Insight can offer. The Insight offers plenty of the same features as the Prius, plus a few more, including automatic climate control, power accessories, a tilting and telescopic steering wheel, and and auxiliary input jack for the stereo system. Yet another example of how you get more for less with the Honda. A stunning design also makes the Insight a hit. Besides its sleek exterior, the Insight features a comfortable, well furnished interior with a smart look front console. 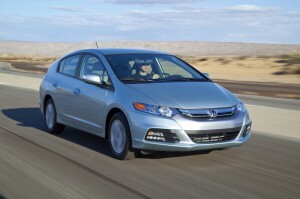 The 2013 Honda Insight is another great addition to Honda’s incredible lineup of vehicles. If you would be interested learning about the other advantages of the Insight and its different options, don’t hesitate to contact our sales team. Middletown Honda is located at 520 Route 211, in Middletown. We’re proud to continue to serve the area with excellent service. Come on by and see why customers choose us again and again!